Here in Maine we are experiencing one of the most brutal winters in a long time. Sub zero mornings make chores slower and not as much fun. However the alpacas are doing well. They are kept out of the wind gusts and have plenty of hay. We are looking forward to spring! Our store is doing well. Socks seem o be the best selling item though gloves, scarves and hats are going fast also. Many thanks to the many people who attended our Maine Open Farm event held yesterday. We had a great time with talks about the alpaca life style, starting a farm and giving a variety of fiber demonstrations. There were many smiling faces when they saw our animals. The alpacas had a great time showing off for the visitors! Armando, the newest member of our herd! Carrageen Alpacas is proud to announce the acquisition of a stunning 16 month old male, SuriPaco's Armando. This light fawn boy has it all, lock, twist, luster and density! Pictures are soon to follow. We are proud to add his genetics to our growing herd. For more information contact us at carrageens@securespeed.com. We have just added a beautiful white girl to our herd. Her name is SuriPaco's Petra. She has a sweet personality and her fleece is wonderful. Great locking and fineness. You can see her in at MAPACA in Harrisburg, Pennsylvania. Our goal has always been to improve our herd and fleece quality each year. This we feel we are accomplishing. By combining Snowmass, Sweetbriar and SuriPaco genetics in addition to a variety of colors, we are now able to provide a quality we are very proud of. Congratulations to our show winners! 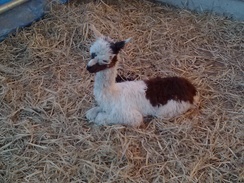 Congratulations to our Domingo who took a 4th place at the National and a 1st at the North American Alpaca Show! Congratulations to Allante who took a 4th place at the National! Congratulations to Clarita and Isis for each taking a 1st at the North American Alpaca Show! No one needs to be reminded that it has been an unusually cold winter here in the northeast. We have had many days of sub-zero and single digit temperatures. While alpacas generally do well in the cold, precautions need to be taken. 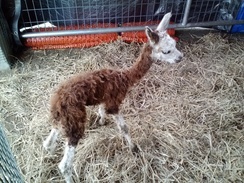 Making sure that they have clean dry straw bedding, housing ( a barn or run-in shed) and a ready supply of hay and warm water will help them make it though this tough period. 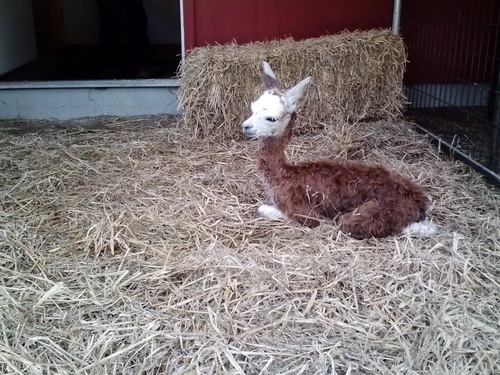 A new cria at Carrageen! On September 30, Our Annie delivered a beautiful pattern girl, Elizabeth. Weighing 12.7 lbs. 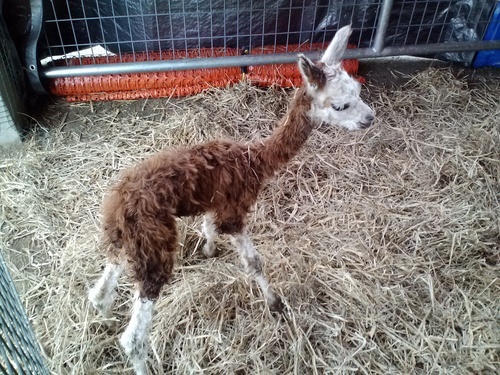 at birth, she has quickly gained weight and is now romping with her other cria friends. What a sweetheart she is, just like her mother! How quickly the Summer went! Now it's time to prepare for the Fall. 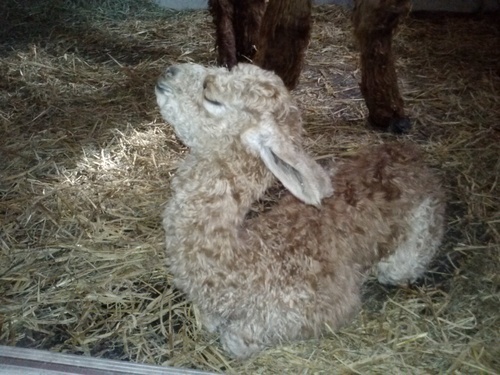 We will be having 2 crias soon. Our Gentle Annie and Sojourner Truth are due to deliver within the next month. We are very excited about the prospects of that. Also we are busy fencing in our new property addition. We have added 10 acres but are only fencing in 2 right now. The rest will be done next Spring and early Summer. Finally our last summer Cria at Carrageen! It took 10 days longer than we expected, but our JackeeO finally delivered a healthy 12.7 lb. (today a 13.3 lb.) boy. He is a pattern but has a nice full brown on the blanket. Mom is doing great. She definitely has read the motherhood book! No name yet, but we'll have one soon. 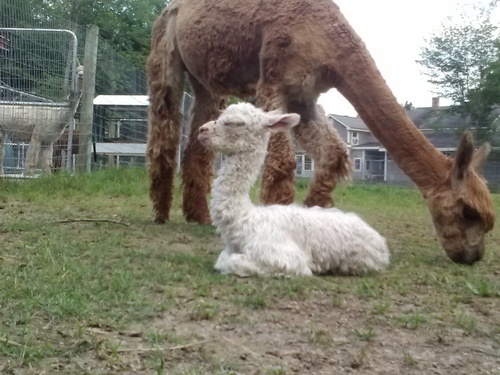 On August 7, 2013 we added 2 more cria to our herd. at 8:52 AM our Chipita gave birth to a beautiful white girl, Ginesa. Her grandfather (the great Crown Royale out of Sweetbriar Farm) was white so we think that his genes have come through in her. She just shines in the sun. Father Roth ( son of Crown Royale) hs done us proud.